The Black Knight II is now online and available to players as a sequel to the classic Black Knight. With its medieval theme, the Black Knight is back to fight for the honour and glory in a tournament for its king. With 10 extra paylines, (now 5 reels and 40 paylines) the game has an extra row of symbols. Powered by WMS Gaming, this game can be played for as little as 40p a spin up to a max of £120 per spin. It’s a G+ Deluxe slot (like Kronos) meaning it has incredible graphics and animations as well as an exciting free spins bonus feature. 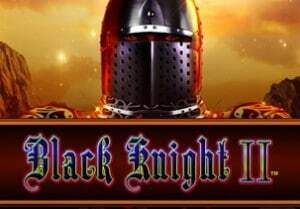 Black Knight II is a predominantly free spins based game with locked wilds and re-triggers in the feature. In other words it is a G+ slot. Just like the original game, a Free Spins feature can be played when you get 3 or more Black Knight shield symbols on the first 3 reels. There is a maximum of 7 free spins with no re-triggers available. Nudging wilds are a plus when the Black Knight wild symbol appears on reels 2, 3 or 4. The wild will nudge to cover the entire reel and remain locked in place for the remaining free spins. If you get 3 locked wild reels, you’ll have a total of 12 sticky wilds (the original only had 9). Huge wins can be the result with 3 locked wild reels. Unfortunately, as in the original game, additional free spins cannot be won. Black Knight II is very similar to the original version and most changes are basically cosmetic. It is much more colourful, convenient and interesting. With the additional row of symbols, your win potential is much bigger in the Free Spins feature. Once I got 2 locked wild reels in the first free spins and the third wild reel in the second free spins resulting in a massive 450 times my stake – was lovely considering I was playing at £2 a spin. Just like the original, Black Knight II is a great slot game in my opinion. Patience is needed though as the Free Spins feature will not always pay out huge amounts. Big wins occasionally are enough to keep me coming back to this slot which has become one of my all time favourites.